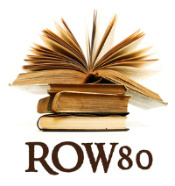 Ooh, nearly done with ROW80 but still time to cram to make those lagging goals. 1990 words written on my YA novel. I still think I’ll finish around this weekend. I’m currently out of town on business so it’s all I can do to write even 100 words at night, let alone work on the other stuff. Still, I think the goals are all achievable though the MS edit may be nick and tuck.